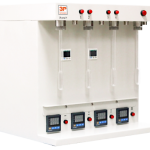 The 3P micro 100 is a fully automated volumetric sorption analyzer for measuring adsorption and desorption of nitrogen and other non-corrosive gases on one analysis station. The instrument can be fitted with a turbomolecular pump system and low-pressure sensors for micropore and krypton analysis. Depending on the customer, the instrument can be equipped with a mesopore station (A version) or a micropore station (C1 and C version). The analysis station is paired with a dedicated p0-cell with its own pressure sensor. Two separate degassing stations are installed on the 3P micro and can be run parallel to the analysis station.